Use of Azolla in Agriculture - Azolla is a native water plant with some seriously exciting attributes for anyone looking to develop closed-loop cycles, which holds the promise of providing a sustainable feed for livestock. Azolla is an excellent aquatic green manure plant, and was until recently used extensively in Vietnam, China and other parts of Asia in rice paddies, where it would cover the surface of the water in the paddy and out-compete weeds while the rice grew, fixing nitrogen and contributing fertility as it went. Azolla covering water surface reduce light penetration of soil surface, resulting in the depreciation in the germination of weeds (70% of the weed). Thus growth of azolla reduces aquatic weeds in flooded rice fields. The integrated use of azolla with rice and fish farming has been developed. The integrated approach can enhance a farmer's income while reduce the use of pesticide and fertilizers and consequently environmental pollution. It can fix atomospheric nitrogen, carry out photosynthesis and uptake nutrients from its surrounding environment through its root system. 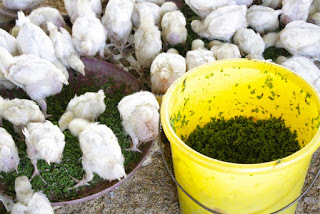 It has wide range of use including fodder for dairy cattle, pigs, chicken, ducks and fish. Azolla can be used for all type of vegetables and plantation crops. In some village communities it has even increased milk in cows by 15-20%. The application of azolla as biofertilizer on agriculture crops, in order to provide a natural source of crucial nutrients nitrogen, can be very beneficial for the future. Due to fact that rice paddy field from an ideal environment for azolla. Improve the nutritional status of the soil. Azolla has been used as green manure for paddy agriculture for weed supression and fertility (used extensively in organic duck and rice systems). Azolla can be used as an animal feed a human food, a medicine and water purifier. When introducing azolla as feed, the fresh azolla should be mixed with commercial feed in 1:1 ratio to feed livestock. After a fortnight of feeding on azolla mixed with concentrate, livestock may be fed with azolla without added concentrate. It may also be used for the production of hydrogen fuel the production of biogas the control of mosquitoes and the reduction of ammonia volatilization which accompanies the application of chemical nitrogen fertilizer. 0 Response to "What are The Uses of Azolla"